After leaving the rather explosive 2008 version of Marvel Comics lovable green monster ‘The Incredible Hulk’ I decided to revisit Ang Lee’s much maligned 2003 version which I didn’t hate nearly as much as a lot of people out there did. I guess the movie was a financial disappointment for Universal Pictures even though it rake in a quarter billion dollars world wide, but considering ‘Spider-man’ pulled in almost a cool billion world wide for Sony Pictures, I guess a quarter billion just ain’t enough. I imagine the new film will do better for the newly minted Marvel Studios and it does have some advantages over the first film but is Louis Letterier’s ‘The Incredible Hulk’ a better movie than Ang Lee’s ‘The Hulk’? I’m not so sure that it is. 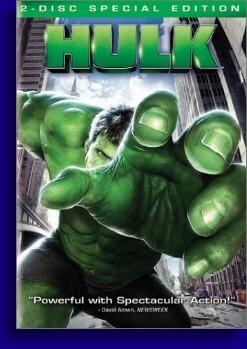 This version of The Hulk begins with Bruce Banner’s father David Banner doing some genetic research on an army base under the guidance of General ‘Thunderbolt’ Ross with Ross refusing to allow Banner to undergo human trials on a gene altering hormone to help soldiers repair themselves on the battle field. Like any self-respecting movie geneticist will do, Banner uses himself as the test subject with the one drawback to that being that the now genetically altered Banner has impregnated his wife, thus leading to the genetically altered baby Bruce Banner. Ross and Banner’s fractured relationship comes to a head, resulting in Banner blowing up his lab and losing his family with him being locked away for a number of years. super angry invincible green monster. With the Hulk now unleashed General Ross (Sam Elliot) is back on the scene and is none too happy to see that his estranged daughter is talking to a Banner, despite the fact that Bruce doesn’t even know he’s a Banner. Bruce’s father (Nick Nolte) has returned to explain that it’s his altered genetics that saved him from dying from the gamma exposure but it has unlocked the Hulk inside which he has some definite plans for. There’s also the evil corporate dude Glenn Talbot (Josh Lucas) who also sees green when he sees The Hulk, but we’re talking dollars here as Talbot has plans to make mint creating super soldiers derived from dead Hulk meat. Now the time has come for The Hulk to smash some stuff, General Ross to mercilessly hunt it down, Betty Ross to find that soft underbelly and lest we forget the gamma mutated poodle. What the hell was up with that? There are a couple of problems with the version of the Hulk with the primary issue being that if one is a fan of the comic, this version pretty much threw that out and started out from scratch. Why they did this I do not know, but aside from the green dude and a few major characters there is very little linking the two together. We did notice that The Hulk sidekick Rick Jones got no love in both movies. And if you happen to a be a fan of the comic getting past those alterations are difficult because it leads you to question the majority of the movie, such as the inclusion of Bruce Banner’s father, the whole Banner being adopted story line, the fact that he had the Hulk within him at birth as opposed to this simply being a by product of the Gamma accident just to name a few issues. Other complaints with this version center on the spotty CGI which is valid as the Hulk did come off as a bit ‘rubbery’ looking in some scenes and the whole big mutated dog battle was somewhat suspect, and there were complaints that the movie was ‘boring’. Though I thought ‘The Hulk’ did run a little long I certainly wouldn’t call it boring. A few things that Lee’s version of ‘The Hulk’ has over the new film is that it did take the time to tell a story and if you are able to get past the fact that the script completely kicked the comic to the curb, it’s a decent one. Though the action scenes, such as the dog fight and the completely ludicrous ‘final boss’ electric water monster sequence were questionable, the action sequences with the army were about as good as it gets. Even though William Hurt is probably a better actor than Sam Elliot, Mr. Elliot portrayed General Ross as driven but compassionate where as William Hurt simply made Thunderbolt Ross a lunatic. But again, William Hurt’s General Ross is closer to the comic version of General Ross. Comparing the actors playing Bruce Banner is difficult because both characters are so different. Edward Norton is a damn fine actor but he didn’t have a helluva lot do in the new movie as he and the Hulk were really two separate characters. This version did a better job of giving some kind of symbiotic presence to the two where you did sense a little of Bruce Banner within the Hulk, at least more than you do with the new film, but still not much. The bottom line is that the new version of the Hulk is a better comic book movie than the previous film, by a long shot. It stays closer to the comic, it has better CGI, as it should since five years is a lifetime in the computer graphics world, it also has more familiar characters, and has a REAL hulk villain and no water electric monster or mutated poodles. Ang Lee’s version of The Hulk is quite honestly a more ambitious and a more complete movie with characters that are more fleshed out and are more realistic. That all being said, if I were forced to choose one or the other to be THE Hulk movie, it would have to be the new one because though we like realistic characters and complete stories, when we go to see comic book movies we want to see the characters we grew up reading doing what we expect them to do. ‘The Incredible Hulk’ does this where ‘The Hulk’ does not.